On this episode I had the pleasure of speaking with Chris Aburime, Executive Vice President and Co-Founder of Augurian, a Minneapolis search agency on SEO. Chris has over twenty years of experience in search so it was great getting his take on skill gaps in the industry and to get some practical SEO tips when going through site migrations. This episode was a bit of an experiment, nevertheless, a lot of fun. Paul Feiner, Director of Marketing at The Big Know, joined me to talk about product marketing at a local startup. Paul leads the marketing group at The Big Know with various backgrounds in BA, content marketing, and social marketing. He even has has a side hobby, I Love Minnesota Sports, a Facebook page dedicated to Minnesota sports fans. I've worked with Paul while at GoKart Labs and really admire his witty demeanor and empathy for the end user. Paul is as nice as they come, very passionate, and because he's been honing his craft for the past few years, I wanted to have him on the podcast to talk a little about product marketing at startups through the lens of The Big Know. Hopefully you find this episode as interesting as I did. If you want to hear more from product marketers like Paul, please leave a request below. As I mentioned, this episode was a bit experimental, but if there's an interest in knowing more product marketing as it relates to martech, adtech, digital marketing, or measurement let me know. I had the pleasure of speaking with Dennis Still, Founder & Chief Insights Analyst at Bigfoot Analytics, on what it takes to be an analyst in a startup or small company. Dennis has worked for larger companies before but has really spent the bulk of his career in analytics at smaller companies. Dennis is a data "hacker" at heart and I really enjoyed getting his perspective on the skill set and passion that's required to survive in a small company as an analyst. On this episode Brian Hawkins, Senior Partner at Web Analytics Demystified, joined me to talk about testing and optimization. Brian brings over a decade of experience in testing and personalization to the table so it was a privilege to have him on the show. Due to time constraints, we barely scratched the surface of testing on this episode so I plan on doing more on this topic in the future. It's an area that I'm passionate about and one that we warrants much more conversation. Leave a comment below or on Facebook if there's a specific aspect of testing that interests you. I will take that into consideration when putting together the next episode. On this episode I talked with James McDermott, CEO and Co-Founder of Lytics, on Customer Data Platforms. My goal of this episode was to bring a different perspective on CDPs than what Martin Kihn brought through research in the last episode and I think we nailed it. James helped untangle some of the myths we have about CDPs and provided a very passionate perspective on the current and future state of this category. 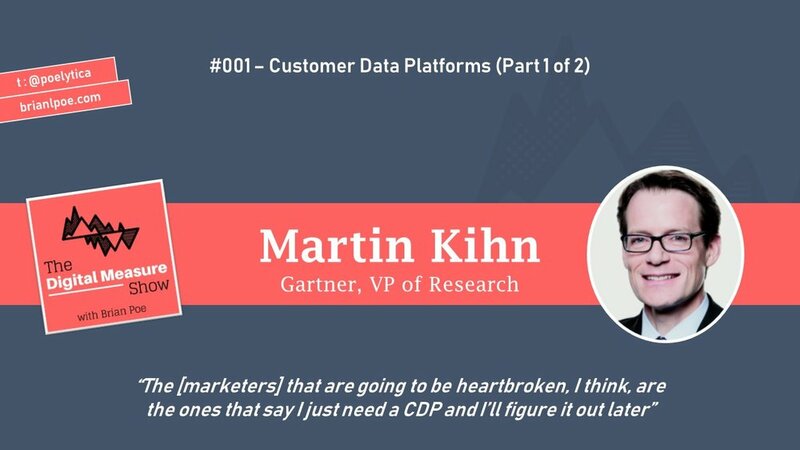 On this episode I talk with Martin Kihn on Customer Data Platforms which is a feverishly hot topic and category in the current landscape of marketing technology. Martin spent the early part of his advertising career at Digitas in New York before stopping in Minneapolis to work for Fallon as the Director of Analtyics enroute back to New York where he is currently the VP of Research at Gartner. Advertising is in his blood so it was my mission to convince Mr. Kihn to join me on The Digital Measure Show and get his perspective on this still young and undefined category. Mission complete! If you liked this episode and would like to hear more on topics like this head over to iTunes to subscribe and rate this podcast. Thanks for listening and hope to hear from you soon! In this episode I provide an introduction, description of the podcast and a sneak peak on episodes 1 and 2 which will be published in a couple of weeks. Please be sure to subscribe on iTunes so you get notified when the first episode is released. Reach out to me on Twitter, LinkedIn or Facebook if you'd like to connect! Really looking forward to kicking off this podcast and talking with talented people in this industry.